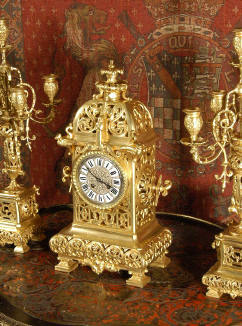 A stunning Rococo garniture clock set, beautifully modelled in gilt metal and mounted with Sevres style porcelain panels. 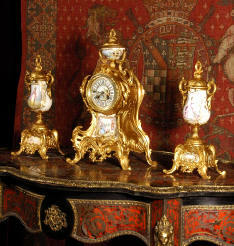 A very elegant brass clock set of good size by Japy Freres. The case is architectural with a basket shaped top and a cushion shaped base. The three sides of the clock are finely fretted with a Chinoiserie influence with entwined geometric foliage and dragons and surmounted by a stylised flower finial. 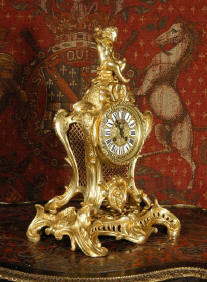 Japy Freres Ormolu Table Clock. 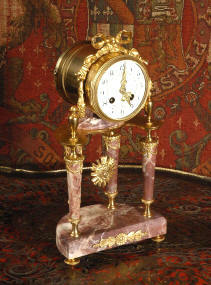 A very chic and good sized French ormolu table clock by the famous maker Japy Freres. The clock looks stunning with very little wear to the original gilding which is exceptionally clean and bright......Click here for full details! 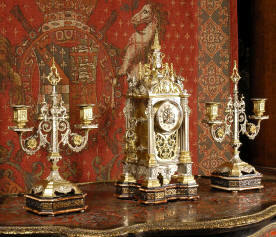 A rare Gothic clock set, finely made of brass and selectively silvered to give a stunning effect. Of the highest quality, the set is constructed from many intricately made pieces and has the retailers mark C.CH. on the movement backplate. 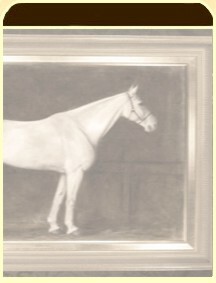 We think this is the mark of La Maison du C. Ch of Paris who specialised in fine interior decor....Click here for full details! 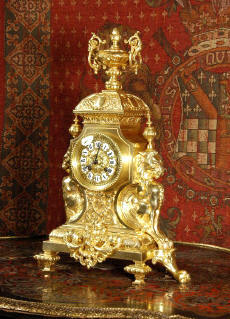 A stunning gilt brass clock by the famous maker Japy Freres. Very heavy and finely modelled, this clock is of high quality and the original gilding is in quite exceptionally bright and fresh condition. 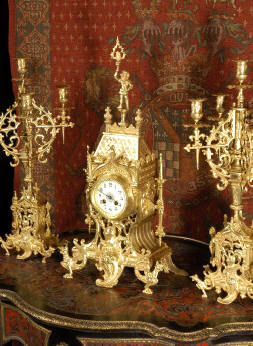 A large and stunning Gothic brass clock set modelled as a castle and decorated with medieval trophies. 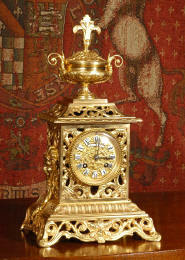 The front of the clock is styled as a knight with a lion and is fretted to allow the pendulum to be seen swinging. The top of the clock forms the roof of the castle and is surmounted by a torch bearer. A very pretty boudoir clock, made of the most beautiful variegated specimen marble which is mounted with ormolu / gilt brass. The original pendulum is visible below the clock and the enamel dial is decorated with delicate floral swags ......Click here for full details! 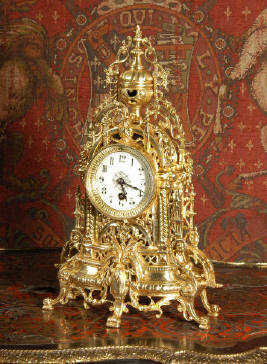 A small and delicate gilt brass French Rococo clock by the famous maker Japy Freres. Of typical Rococo design, with C scrolls, and swirling foliage. The modelling of the case is beautiful and is of the highest quality with sharp detail and the original gilding is clean, bright and fresh....Click here for full details! 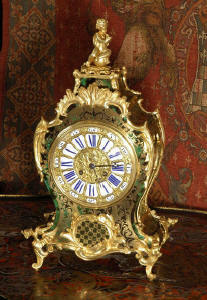 A large and stunning green Boulle bracket clock in lovely, ready to display condition. 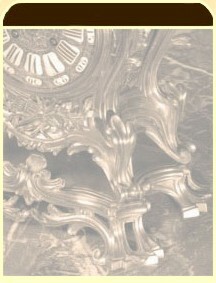 The clock is a classic Louis XV shape with ormolu mounts of Rococo design. The feet are designed as winged mythical creatures and the clock is surmounted by a cherub....Click here for full details!